Beautiful Swarovski top drilled 8mm bicone crystals fashioned into a cluster necklace with matching 4mm bicones at back and Sterling silver findings. This necklace is so pretty and is prefect for the Bride but also for a Bridesmaid too. 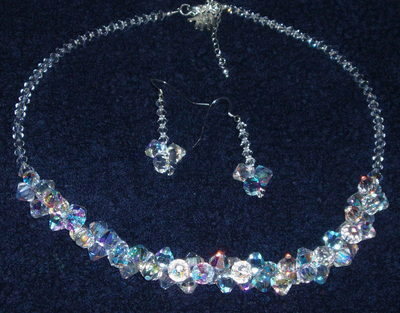 Also fab for wearing to a Prom, or for a special Anniversary or Birthday gift. Choose the colour of crystal that you like best.